Racing Club Warwick ended Heather St Johns’ unbeaten start to the season with a deserved home win at Townsend Meadow. Despite Martin Slevin and the previous week’s hat-trick hero Luke Cole both missing, Warwick started the brighter of the two sides and home debutant Jak Jeys went close at the back post after good work from Marc Passey. Jeys was foiled again by a fantastic stop from the Heather keeper and Sean Castleton, Scott Turner and Joe Smith were all denied from a corner, with the final effort cleared off the line. At the other end, the dangerous Simeon Cobourne, who has already bagged 15 goals this term, broke free but a fantastic save from Charlie Bannister foiled the striker. The game was now evenly balanced and two minutes before the break, Cobourne broke free on the left and squared for Matt Gardner to break the deadlock. Just a minute later, Ben Mackey fired past the keeper to take the teams in level at the interval. With Passey and Rich Powell now starting to push forward on the flanks, Warwick looked more dangerous after the restart. Jeys came very close with a shot that bounced back off the inside of the post and into the keeper’s grateful hands before Mackey settled the game. Collecting the ball with his back to goal he turned and fired in a shot that caught a slight deflection to take it further away from the dive of the keeper. With a one-goal lead to protect, Castleton and Turner mopped up any threat from Heather in the final stages, with the home side always looking dangerous on the counter. 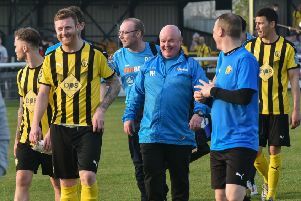 However, there was no further scoring and Racers’ manager Scott Eastlerlow said the timing of their equaliser was key to their victory. “I felt we controlled the game for long periods, although we might have had more of a cutting edge at times. “We were the side that saw more of the ball and I felt we were very unlucky to be behind. Mackey again caught the eye with a double and Easterlow said the striker’s prolific form has not gone unnoticed. “I thought defensively we were solid all game and Ben showed exactly why I tied him to the club before last season had even finished. Racing Club are back in action tomorrow night when they entertain struggling Nuneaton Griff.